In Tibetan, Guru Padmasambhava is generally referred to as Guru Rinpoche, which means “precious master.” Guru Rinpoche is a totally enlightened being, a fully awakened one, a buddha. He did not become enlightened gradually, or start practicing the teachings of Buddha Shakyamuni and eventually achieve enlightenment. Guru Rinpoche incarnated as a fully enlightened being. Through his form, primordial wisdom manifests in the world to benefit all sentient beings. Buddha Shakyamuni actually predicted Guru Padmasambhava’s appearance. Nineteen different sutras and tantras contain clear predictions of his arrival and activities. In the Mahaparinirvana Sutra, Buddha Shakyamuni announced his own mahaparinirvana to the students who were with him at the time. Many of them, particularly Ananda, the Buddha’s cousin and personal attendant, were quite upset upon hearing this, so the Buddha turned to Ananda and told him not to worry. 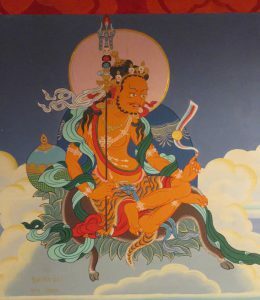 “Eight years after my mahaparinirvana, a remarkable being with the name Padmasambhava will appear in the center of a lotus and reveal the highest teaching concerning the ultimate state of the true nature, bringing great benefit to all sentient beings.” Buddha Shakyamuni said that Padmasambhava would be even more enlightened than himself. Of course, Buddha Shakyamuni was fully enlightened and there is no higher realization, but by the Buddha’s manner of expression, we can begin to understand the importance of Guru Padmasambhava. Some accounts hold that Guru Rinpoche is a direct reincarnation of Buddha Shakyamuni. Buddha Shakyamuni also said Padmasambhava would be an emanation of Buddha Amitabha and Avalokiteshvara, and referred to him as the “embodiment of all the buddhas of the three times.” Many prophecies indicate that Guru Rinpoche would be a fully enlightened buddha, appearing in this world to help sentient beings. For the most part, Buddha Shakyamuni presented “Hinayana” and Sutra Mahayana teachings, while Guru Padmasambhava taught the Vajrayana. Both revealed the complete and perfect path to awakening so that individuals of all capacities would benefit. The absolute level of the Buddha’s teaching is beyond conception. If it didn’t go beyond the conceptual level, there would be no need to change our normal way of understanding things. To help us realize the primordial nature, Buddha Shakyamuni repeatedly taught that we must transcend clinging to our ordinary dualistic conceptions, narrow attitudes, closemindedness, traditional rules, beliefs, and limitations. The ultimate meaning of the highest teaching is not easily understood by sentient beings. This is why Buddha Shakyamuni remained silent for forty-nine days after his enlightenment. He thought, “I have realized the most profound and subtle Dharma, the clear light free of all complexity. However, this is much too deep for normal people to understand. Therefore, I will remain silent.” He knew how hard it would be to communicate the truth of his insight. Although he eventually taught tirelessly for forty-five years, his first thought reflected the extraordinary nature of the state into which he had awakened all of his relative, mundane ideas and conceptions. Sutra is a Sanskrit word that means “condensed” or “summarized.” Scriptures bearing this title indicate that these teachings were directly communicated in this world in order to provide a clear understanding of the two truths—both the relative and absolute aspects of reality. The sutras provide instructions that a practitioner can apply to realize buddhahood. Most of Buddha Shakyamuni’s teachings address ordinary beings and offer a direct way to understand the nature of our experience. They present a non-esoteric view that appeals to common logic, with tenets that can be verified by close observation of the elements that constitute our everyday world. With this knowledge, you can move toward enlightenment. This is the basic intention of Sutra Mahayana. The Vajrayana is also known as Tantra. 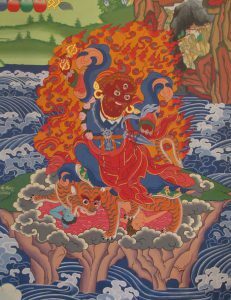 Tantric teachings are based on the Sutra Mahayana, but offer a more subtle understanding of our experience and additional methods to realize enlightenment. Vajrayana practice encourages us to take a deeper look at our perceptions, recognize our primordial nature, and maintain our mind in its natural state. In this way, the sutras are more general teachings that clarify the nature of conditioned mind and its perceptions, while the tantras reveal the secret, subtle structure of our body, mind, and all phenomena. Therefore, the Vajrayana teachings were given for more advanced practitioners. Although the sutras and tantras both share the same foundation, the Vajrayana goes further towards understanding transcendental reality as it is without being distorted by our habitual, conditioned mind. Practicing the sutras and tantras in union can bring enlightenment within this very life, even within a very short period of time. Accelerating our path to enlightenment is a principle distinction between the practices of the sutras and tantras. The Buddha only gave Vajrayana teachings privately to select groups of disciples. Because the essence and even the form of these higher teachings are beyond common conception, they are known as “secret teachings.” After the Buddha entered mahaparinirvana, these secret teachings were preserved by many wisdom dakinis. 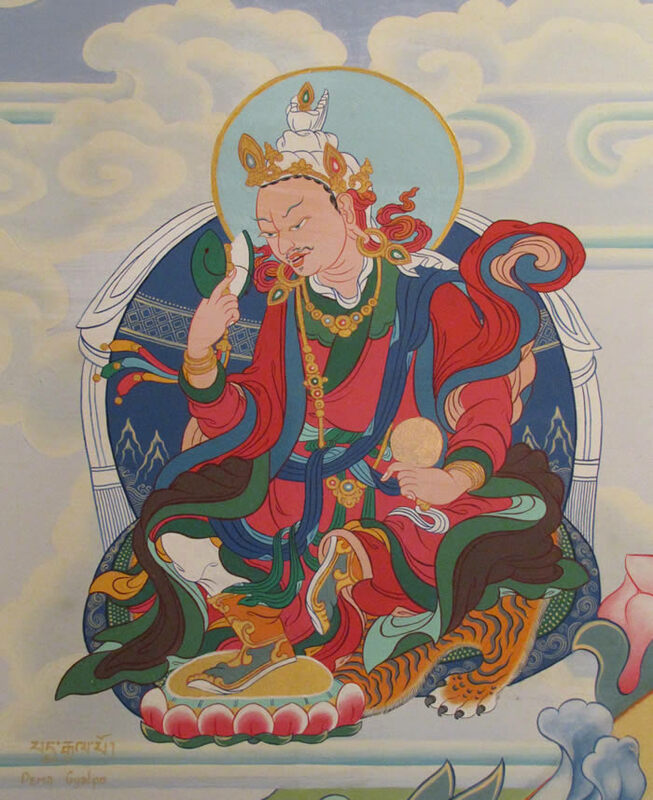 When Guru Rinpoche appeared as the reincarnation of Buddha Shakyamuni, he revealed the Vajrayana teachings in their entirety; this is why Guru Rinpoche is known as the Buddha of the Vajrayana. Our present knowledge is limited to the input of our six sense consciousnesses. There is a limit to what we can see with our eyes. We hear sounds within the spectrum detectable by human ears. The flavors and fragrances we experience are within the limits of our senses of taste and smell. What we feel is conditioned by our degree of sensitivity to touch, and what we think reveals the parameters of our mental concepts and emotions. We do not really extend beyond these limitations. These six sense consciousnesses define the limits of our knowledge and make up our individual points of view. We can ignore what lies beyond our senses and imagine that other things cannot exist, but there’s really much more to life than what we perceive. We only notice about one percent of what’s happening and habitually ignore the other ninety-nine percent we haven’t yet discovered. Our knowledge is very limited. We shouldn’t block our ability to learn by assuming that what we can’t see doesn’t exist and isn’t possible. This kind of thinking obstructs further learning, as if we didn’t really want any deeper understanding. We block every opening and sit there in the dark. We must open the door. This is the first type of ignorance that we must recognize. It’s always necessary to stay open and aware that there is an infinite spectrum of knowledge still to be discovered. For example, if somebody next to you was threading a needle, it would be pretty obvious what he or she was doing. But from a hundred yards away, you wouldn’t see the needle or the thread. You might even imagine that there wasn’t a needle simply because you couldn’t see it. This is the limitation of the knowledge we receive through the narrow power of our eyes. It doesn’t mean that nothing is there—we just don’t see it. There are so many things to be discovered beyond our present understanding. Beings who realize great equanimity discover the infinite energy of the true nature and can perform many beneficial activities using their eyes, ears, nose, tongue, and body. They don’t always act conventionally or in ways that we normally understand. They may do things that don’t fit in with our usual perceptions. Phenomena and events that seem to go beyond physical limitations are sometimes referred to as “miracles.” At times, those who have the capacity will display miraculous phenomena in the common world. People who don’t believe in the possibility of miracles think that these stories are myths, metaphors, or fairytales. In truth, there are people who can do amazing things, just as the ancient masters did. Don’t ignore certain aspects of the universe by thinking that they are just stories. The cosmos contains an infinite variety of wondrous qualities and activities. These miraculous qualities and activities are totally incomprehensible from an ordinary, mundane point of view. They manifest to destroy the limitations of all conventional approaches to knowledge. Ego-based discriminations and habits have divided the world into “samsara” and “nirvana.” These dualistic notions are the only real cause of unhappiness. Guru Padmasambhava breaks through our dualistic patterns to lead us to perfect enlightenment beyond conception. In order to have a deep understanding of the meaning of Guru Padmasambhava’s activities, it’s important to keep an open mind. We must go beyond our present conceptual limitations and realize how our tendency to doubt and criticize fills our minds with contradictions. Most of our decisions are based on simple conceptual polarities. Don’t restrict your mind to the two extremes of affirming or denying. We ignorantly believe in the adequacy of this way of thinking and assume that what we don’t see does not exist. If we create sharp divisions and cling to narrow definitions of subjects and objects, whatever we see will always appear in the context of those limitations. When we see something, we say, “Yes, that exists,” but what we don’t see directly is easily denied. In Buddhism, these views are known as “obscurations” or “dualistic conceptions.” They do not lead to true knowledge or wisdom since they are based on ignorance. It is ignorance that defines our experience of the world and puts limitations on our vision. We have to break through these barriers in order to understand the perfect activities of Guru Padmasambhava’s emanations and the infinite possibilities of the true nature. Dzogchen is the highest teaching of the Buddha and Guru Padmasambhava, but more precisely, Dzogchen is our real situation, the reality of all phenomena. Practice helps us break through the walls of our ego-clinging and merge with the infinite expanse of our mind, or rigpa, where anything is possible and everything arises perfectly without moving out of the sphere of equanimity. All of Buddha Shakyamuni’s teachings, from the Hinayana up to Dzogchen, are designed to transcend all of our dualistic conceptions and actualize the full range of marvelous activities that arise within this profound equanimity. This is the central point of the Dharma and the inspired intention behind the actions of every great master. Guru Padmasambhava’s teachings offer a direct path to actualize this understanding. His enlightened activity is especially powerful and effective in destroying the solidity of our dualistic concepts and fixed opinions, and in awakening us to true freedom. The wisdom dakini Yeshe Tsogyal said that Guru Padmasambhava has 9,999 biographies. That’s a lot of biographies! 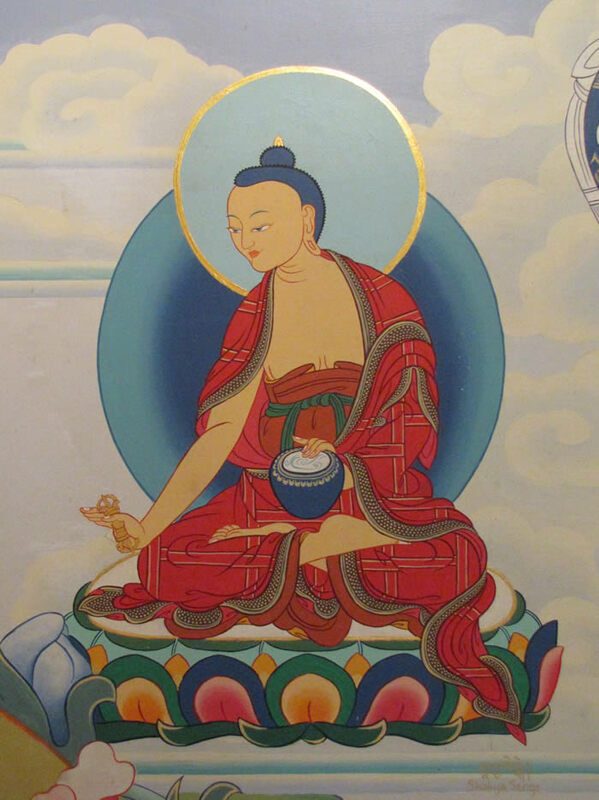 These biographies are divided three ways: (1) those relating the 108 activities of Guru Rinpoche according to his dharmakaya essence, (2) accounts told according to his sambhogakaya nature, and (3) works chronicling his compassionate activities as a nirmanakaya buddha. On the dharmakaya level, Guru Rinpoche is known as the Primordial Buddha Samantabhadra. Inseparable from Buddha Shakyamuni and all fully enlightened beings, his appearances are never obscured or deluded, always free in the ultimate sphere of dharmakaya. He is our true nature, which is also known as “all-pervading primordial wisdom,” because it permeates every external and internal object in the ten directions unceasingly. This is the dharmakaya Guru Padmasambhava. Fully awakened, this great equanimity is completely free of all conditioned marks and complexities. The dharmakaya continuously emanates five wisdoms in every direction. These appear as the Five Dhyani Buddhas, or the families of wrathful, semi-wrathful, and peaceful buddhas and their retinues. All these buddhas are Guru Padmasambhava in sambhogakaya form, emanating wisdom lights to liberate all sentient beings in the six realms. Different emanations of Guru Rinpoche appear in each of the six realms, as well as in every direction within those realms, to teach sentient beings according to their capabilities and gradually lead them all to enlightenment. There are one hundred million nirmanakaya emanations of Guru Padmasambhava helping sentient beings throughout the universe. Guru Rinpoche may take any number of forms within any realm. He is not limited to appearing in any particular way. His character and way of teaching varies depending on the sentient beings he is helping. 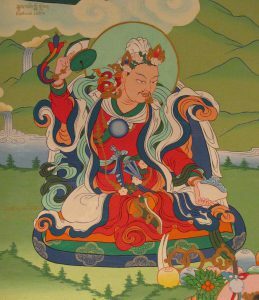 In the mundane sense, Guru Padmasambhava’s activities are called “miraculous,” but from the viewpoint of absolute reality, they are not unusual phenomena. They are the natural, spontaneous activity of the true nature. From the perspective of realization, our normal, everyday activities are somewhat odd and unnatural. In this sense, we are all great magicians, conjuring up something totally unreal. When Guru Padmasambhava appeared on this earth, he came as a human being. In order to dissolve our attachment to dualistic conceptions and destroy our complicated neurotic fixations, he also exhibited some extraordinary manifestations. If we try to compare our situation and capacities with that of Guru Padmasambhava and other realized beings, we will run into some difficulty. Our actions are based on dualistic ideas and habit patterns, while Guru Padmasambhava’s activities arise spontaneously out of the great equanimity of the true nature. Nondual activities are incomprehensible within the scope of dualistic understanding. A famous Tibetan master named Sakya Pandita spoke of a man who journeyed to a country totally inhabited by monkeys. When he arrived, all the monkeys gathered around to examine him. They were amazed. “How strange!” they thought, “This is the most unusual monkey we have ever seen. He has no tail!” Similarly, deluded sentient beings hear of the activities of enlightened beings and think that such stories must be mythical or magical because they don’t meet our preconceived ideas of how the world works. There are many stories that explain how Guru Padmasambhava was born. Some say that he instantly appeared on the peak of Mount Malaya in Sri Lanka. Other teachings say that he came through his mother’s womb. But most accounts refer to a miraculous birth, explaining that he spontaneously appeared in the center of a lotus. These stories are not contradictory because highly realized beings abide in the expanse of great equanimity with perfect understanding and can do anything. Everything is flexible and anything is possible. Enlightened beings can appear any way they want or need to. According to the regular, conventional way of thinking, if something is black, it is not white. Usually, only one of these notions can be applied at any given time. When we try to make reality fit the limitations of our preconceptions, we become very narrow. Working in this way will not allow us to understand the mystical or profound aspects of the universe. Our tiny peephole of knowledge reveals very little of the actual world. We see only what fits through that small hole. Chronological and linear thinking is characteristic of dualistic conceptions; we cannot apply it to the true nature or the state of great equanimity. Peering through such a small crack will not allow us to see much—we have to open our minds if we’re interested in seeing more. Buddha Shakyamuni taught that there are infinite world systems containing an infinite number of sentient beings. Therefore, there are also countless emanations of enlightened beings to help with their awakening. There are thirty-six other world systems that are near our own. Each one has a different emanation of Guru Padmasambhava. Our own world is divided into six realms: (1) gods, (2) asuras, (3) humans, (4) animals, (5) hungry ghosts, and (6) hell beings. To help liberate all sentient beings, there is a special buddha, as well as eight emanations of Guru Padmasambhava, in each of those realms. That is, there are eight emanations of Guru Padmasambhava in the god realm, eight in the asura realm, and so on. 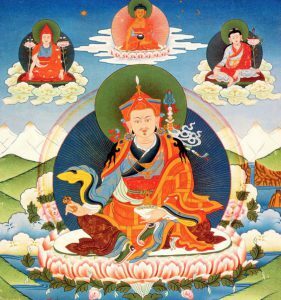 Each emanation displays unique qualities in relation to the beings to be helped and might be unrecognizable by any outer signs. In the human world, Guru Padmasambhava displayed 108 activities. 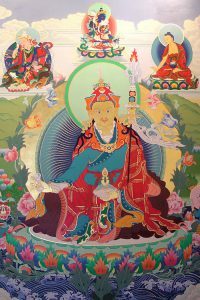 These are summarized within his twenty emanations, and are most easily understood as the eight manifestations of Guru Padmasambhava. Depending on your spiritual needs and interests, you can also achieve very specific results by practicing on Guru Padmasambhava. In his commentary on the Seven Chapter Prayer of Guru Padmasambhava, the great master Karma Chagme taught what these specific results are and how to realize them by practicing on the eight emanations of Guru Rinpoche. The enlightened activities of Guru Rinpoche’s eight emanations are especially powerful and effective in destroying the solidity of our dualistic concepts and fixed opinions, and in awakening us to true freedom. If you want to cleanse and ultimately remove negative obscurations, you can practice on Guru Padmasambhava in the form of Padma Jungne. Guru Padma Jungne is renowned as a very special buddha of purification who removes our ignorance and helps us reveal our primordial wisdom. To increase your intelligence, you can practice on the emanation known as Guru Padmasambhava, a buddha of meditation and wisdom. Guru Padmasambhava is associated with transforming negative energy into more peaceful and compassionate forms, and with developing power and a heart of loving-kindness and compassion. Guru Loden Chokse demonstrated how to develop profound knowledge through study and practice. If you want to master a wide variety of disciplines, you can meditate on Guru Loden Chokse, who like Padmasambhava, is a buddha of wisdom. By practicing on Padmasambhava you develop clarity and focus, and by practicing on Loden Chokse you develop far-reaching abilities. Guru Padma Gyalpo openly demonstrates the splendor and magnificence of perception and conception when they’re completely free of ego-clinging and negative emotions. If you’re a leader and wish to expand your dominion, or if you want to attract the goodness qualities of others, such as love and appreciation, you can practice on Guru Padma Gyalpo, a buddha who magnetizes others towards the Dharma. Practitioners who want to deepen their spiritual growth, as well as lamas who want to expand their beneficial activities to reach more beings, can meditate on Guru Nyima Ozer, a buddha of experience and realization. If you’re beginning to practice love, compassion, and wisdom, but are limited in your ability to fully embody your understanding, Guru Nyima Ozer will help you actualize these qualities and make them shine out to benefit all sentient beings. Guru Shakya Senge demonstrates how to awaken in this lifetime by using discipline and renunciation. If you’re on retreat and worried about obtaining provisions or what will happen to your livelihood after retreat; if you want to maintain good morality and no longer want to be overpowered by habitual patterns; if you want to prevent sickness and untimely death; or if you wish to preserve and propagate the Buddha’s teachings—in all of these cases, you can practice on Guru Padmasambhava in the form of Shakya Senge. 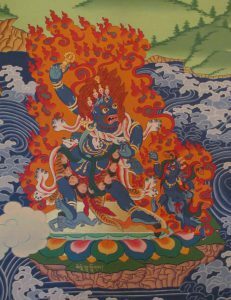 Guru Senge Dradok is very effective in subduing negative influences from black magic, curses, and other disturbances. 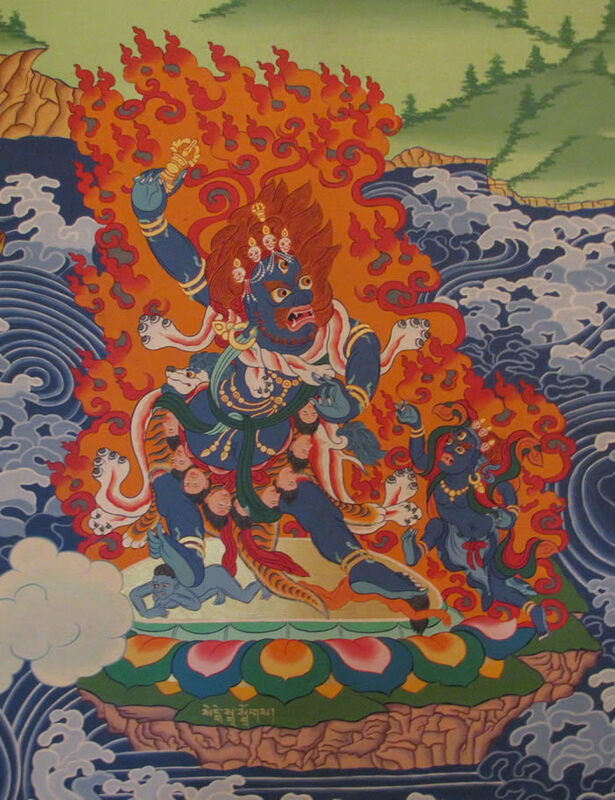 If you’re a scholar about to debate with others, the target of curses or spells, or experiencing trouble and obstacles created by planetary influences, nagas, or invisible spirits, you can meditate on Guru Senge Dradok, a wrathful buddha who destroys all negativity. Guru Dorje Drolo is a very special and powerful emanation to help clear away and dispel complex webs of mental and emotional obstacles. Lamas, ngakpas, and ordinary people who want the help and support of invisible beings, and who also want to prevent ever being harmed or disturbed by them, should practice on Dorje Drolo. The most secret, or absolute way to understand Guru Padmasambhava is to see the entire universe as his display. All phenomena appear within the enlightened space of Guru Padmasmabhava’s pure body, speech, and mind. He is all phenomena. He is also the original nature of all phenomena. What is this original nature? It is the nature of the mind—beyond birth and death, beyond coming and going, beyond appearance and non-appearance, beyond subject and object. This means that the most secret, absolute Guru Padmasambhava is the original nature of your mind. What is it that makes us think Guru Padmasambhava is outside ourselves? Dualistic mind. Duality mind undermines our direct realization of the true nature of the guru. The moment we free ourselves from duality is the moment the most secret, absolute Guru Padmasambhava appears. In fact he is right here right now. He is always with us. Absolute Guru Padmasambhava— the true nature of the mind—is the essential teaching of the Buddha. The result of practicing on Guru Padmasambhava is two-fold: you attain what are known as the ordinary and supreme achievements, or siddhis. The ordinary achievement includes long life, good health, peace and happiness, as well as the ability to fulfill all of your bodhichitta aspirations. The supreme achievement is enlightenment. 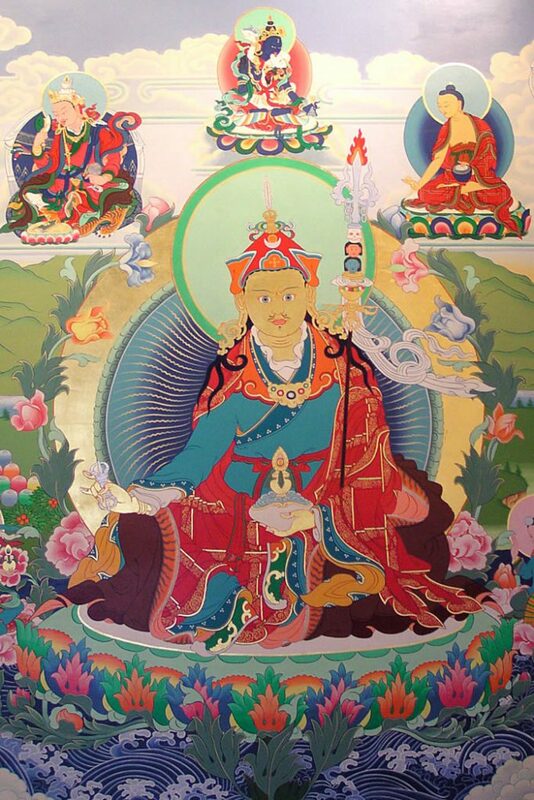 The ordinary and supreme achievements are considered the general result of practicing on Guru Padmasambhava. The teachings say that we should create a daily schedule where we set aside some time devoted solely to practice. By keeping to a schedule we won’t be so carried away by mundane concerns and the endless chores that accompany them. This discipline will help us refine and expand our practice, as well as maintain the original, fresh aspirations we had when we first entered the path. Of course we should conclude every practice with dedication and aspiration prayers for the enlightenment of all sentient beings. Setting aside this time for daily practice will help us stay more connected to the absolute nature of Guru Padmasambhava within ourselves and others. In post-meditation, we should be thoughtful and consider what is good to do and what is good to avoid. We should take care of our affairs in the mundane world using what’s available and helpful on the relative level, but we should try to do this without too much emotion. Bodhichitta, devotion, joy, and appreciation are aspects of the relative truth that we should apply consistently to make our Dzogchen practice much more profound and powerful. As you progress, try to integrate what you’ve learned in meditation into post-meditation. Bring your realization of nonduality into the dualistic world. Keep your mind very spacious and open, and your conduct very careful and refined. Maintain your identity as a practitioner and have courage. We’ve all heard many times that the true nature of our own minds and the entire universe is already enlightened. Yet just hearing this is not enough. We have to practice with joyful effort, courage, and commitment, and if we continue to do this, we will realize the true nature. The true nature is not something that has been created by the Buddha or anyone else; the true nature is what is. Please keep practicing. Every practice requires devotion and bodhichitta—keep yourself inspired! It’s important to remember that what you learn from teachings and books is only theoretical knowledge, which by itself is not enough. You must absorb what you learn into your heart and let it fully blossom.